Directions Adults and children 4 years and over: Use 1-2 packets up to every 2 hours as needed. Children under 4 years: Consult a physician. Consult Instructions for Use for proper use. Inspect saline solution packets for integrity. Do not use if open or torn. Protect saline solution packet from excessive heat and moisture. 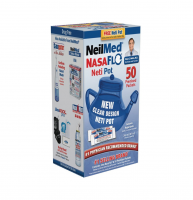 Uses Temporarily relieves symptoms associated with sinusitis, cold, flu or allergies: sneezing, runny nose, nasal stuffiness, post-nasal drip. Removes inhaled irritants (dust, pollen). Promotes nasal and sinus drainage. 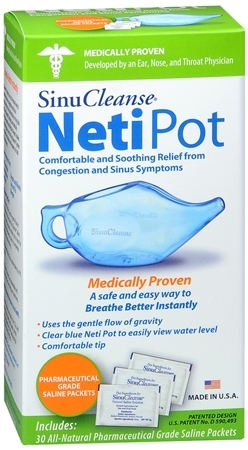 Helps reduce swelling of nasal membranes. Physician developed & clinically proven. 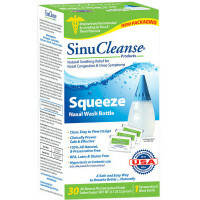 Includes: SinuCleanse Neti Pot and 30 all-natural saline solution packets. Warnings Stop use and ask a doctor if washing is uncomfortable or symptoms are not relieved. When using this product: Use by only one person. Wash with soap and water after each use. Top rack dishwasher safe. Do not heat in microwave. Keep out of reach of children.